The pieces below reflect the rigor of our analysis and allow clients and professional advisors to see if, when, and how life insurance, as one element of an integrated financial plan would or could work to produce favorable outcomes. Roth Conversion vs life insurance – What to do with excess funds: Fund a Roth Conversion, or Purchase a Life Insurance Policy? Financial Advisors often recommend that clients consider the benefits of converting traditional pretax IRAs into tax free Roth IRAs. In order to do so, the client must pay the income on the amount being converted from the traditional IRA. 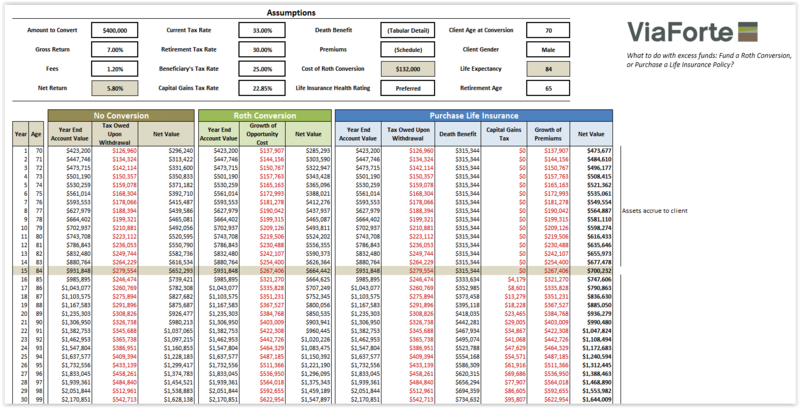 This tool answers the question of whether it might be a better option for some clients to take the tax dollars they would have spent on a conversion and instead use those dollars to pay a premium for a tax free life insurance policy, assuming the money would eventually be transferred on to beneficiaries in whole or in part either way. This preserves the tax deferred IRA and buys an additional new asset instead of simply replacing one asset for another. Economics of life insurance – How Long Would it Take an Investment Alternative to Match a Death Benefit of a Life Insurance Policy? The internal rate of return on a death benefit is often the most used measurement to judge the economic value of a life insurance policy. 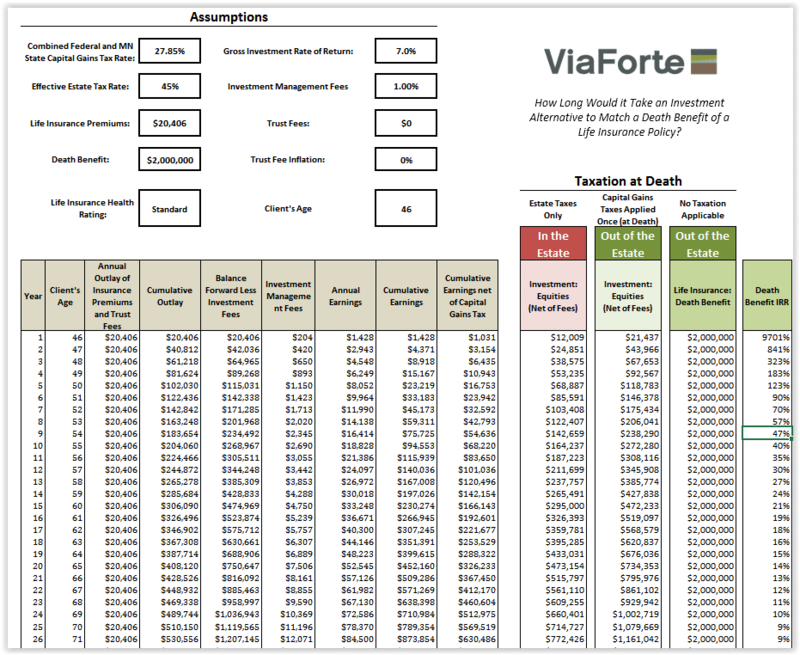 The benefit of this tool is that it demonstrates, at any point in time, the economic benefit of the life insurance compared to an investment alternative. There will almost always be a point in time at which the compounding investment will surpass the death benefit. This generally happens well beyond life expectancy. 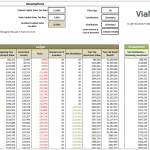 The tool helps to demonstrate the real value of the insurance not based simply on an Internal rate of return number, but also on the future planning reliability it creates compared to other options. The investment alternative assumes premiums are instead invested outside the estate in trust, taxed only one time (at the time of death) at the capital gains rate, and assumes no variance of returns. In other words, we give the investment alternative every advantage. 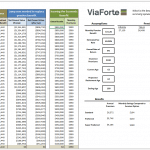 Estate Tax Estimate – What is your future estate tax estimate? 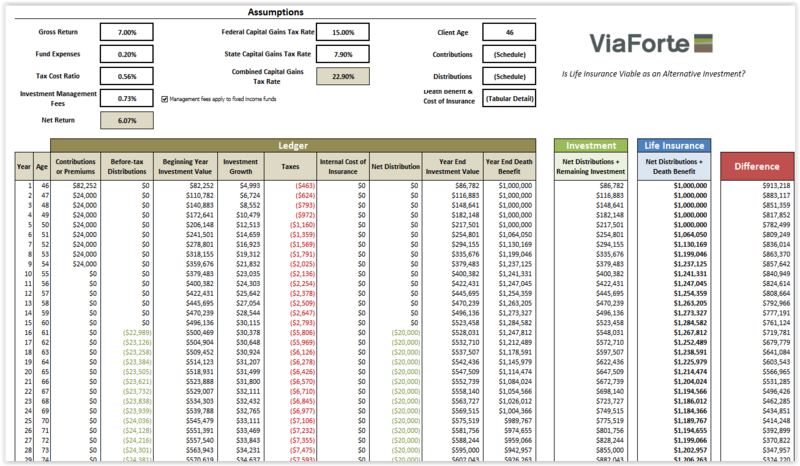 There are a number of estate tax calculators that will provide you with an estimate of a client’s estate tax liability today. 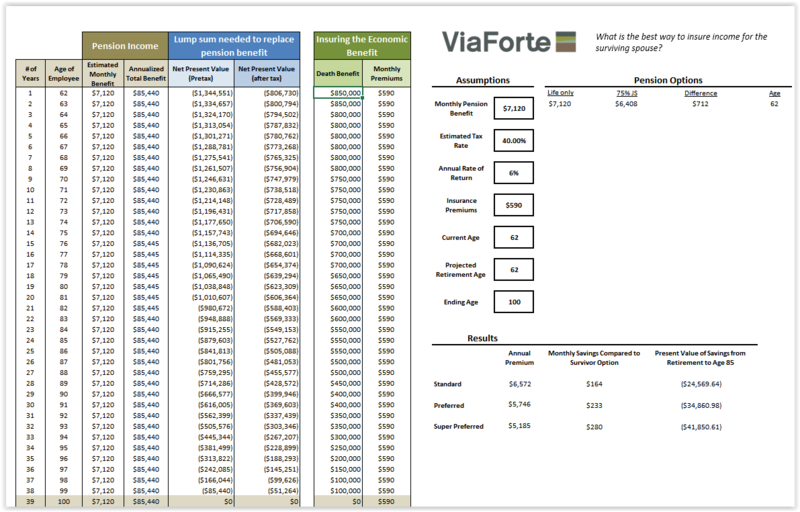 There are also a number of excellent planning software programs like Naviplan and Emoney that will project estate tax estimates into the future, but require a tremendous amount of time and inputs to do so. 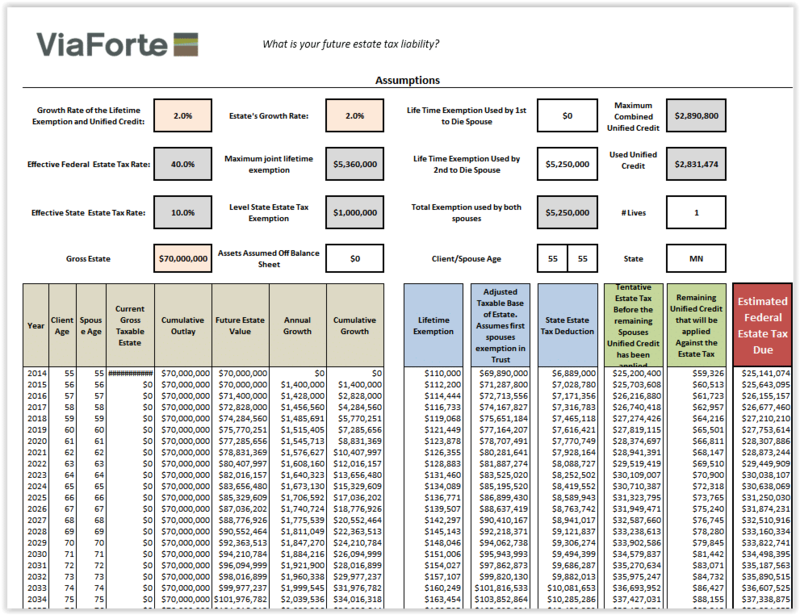 This tool quickly captures all of the necessary inputs and projects future estate tax liability. It takes into account expected inflation of not only the estate, but also the lifetime exemptions and credits included in the tax code. It’s not meant to replace Naviplan or Emoney, but it is designed as a quick tool for future projects. Insurance as an investment – Is life insurance viable as an investment alternative? Strong opinions about with respect to this subject, but few have taken the time to evaluate it accurately. That’s generally because insurance agents so often have lacked the investment acumen to fully capture the objections of professional money managers, and professional money managers have lacked the professional knowledge of insurance products that are necessary to accurately design an illustration to compare to the investment alternative. This tool accurately captures the insights of professional money managers and the professional product knowledge of life insurance specialists to arrive at a tool that definitively gives you an answer as to if, how, and when a life insurance policy might perform well against an investment alternative. 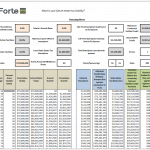 Ultimately, neither the professional money manager nor the life insurance specialist would recommend putting all sources of money into an insurance product, but they might recommend some based on the analysis provided by this tool. 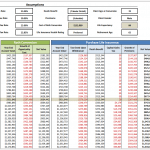 The tool analyzes the same amount being put into a life insurance product and an investment alternative. The question it ultimately answers is: does the cash value of the insurance product, after internal costs of insurance and fees are taken into account, produce more income and benefits than the investment alternative after capital gains taxation? Pension Planning – What is the best way to insure income for the surviving spouse? This tool is designed to look at the possibility of using life insurance to effectively give the soon to be pensioner the option of electing the higher life only payment. This strategy involves using the difference between the life only payment and the joint survivor option to pay premiums on a life insurance policy with a death benefit that would replace the net present value of the remaining future life only income stream in the event of his or her death at any point in time. Generally, we see that the conclusion is that there is not a significant advantage to doing so on a strict cost-savings basis—the life insurance, depending on health ratings, generally matches the benefits of the pension. However, the life insurance option does provide one significant advantage: if the first spouse to die is the spouse of the pensioner, the pensioner will be left with the highest payout he or she could have had, plus the cash value of the life insurance that they could surrender, which may or may not be equal to or greater than what was paid into the policy, depending on the insurance product and design. 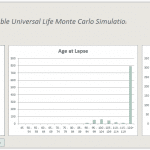 VUL Monte Carlo Simulation – What is the impact of investment return variance on policy performance and funding? 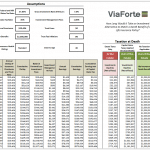 This tool helps advisors determine how much should be funded into a variable universal life policy when they are used given the impact of variance on investment returns. This is especially significant within the confines of a life insurance policy where you have the additional impact of structurally rising costs of insurance each year as the client ages.